RDP offers vacation rentals and condo hotels (companies with multiple properties) a central reservation software capability. A separate RDP database is created for each location which allows unlimited scalability. Reservations can be made at either the central reservation office, at the property, or both. The reservationist can choose to search availability at one property, more than one, or all using different search criteria such as bed configuration or view. A master database of all guests from all properties is available via RDP's Customer Relationship Management (CRM), which includes point tracking and a rewards program. 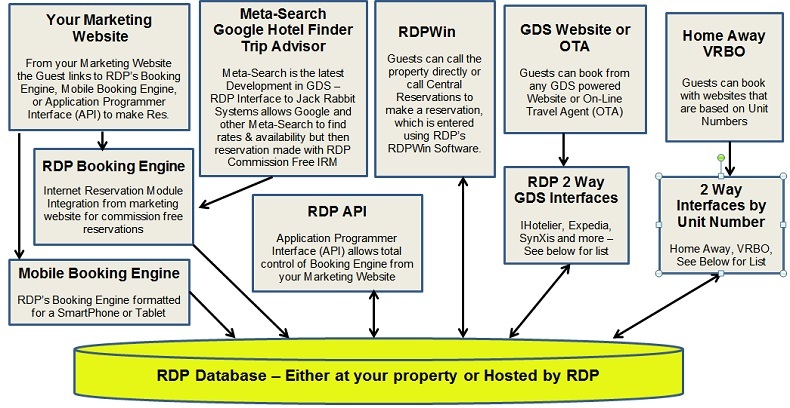 RDP's Central Reservation system allows rate and availability searches across one or more condo hotels or vacation rental resorts. Oceana Resorts uses RDP's central reservations for their 10 condo hotels. They are able to search for availability in one hotel, more than one, or all hotels. In the sample below, they have selected to search for rooms at Harbourgate, Patricia Grand, Bay Watch and Anderson Ocean Club. Central reservations also allows rate calculations across all properties for a seamless transition from the central reservations screen to completing the reservation. RDP's central reservation system has the ability to search for specific guest preferences across all unit types at all properties. For example, a reservationist can search all resorts for 2 bedroom unit types with a Jacuzzi and ocean view. These preferences are fully configurable and designed to work with unit types, not specific unit numbers. The unit number can be assigned from the "Make Reservation" screen once the unit type has been selected. All unit types can be included or certain types excluded from the central availability. The system can also search all room types available at any vacation rental or condo hotel location, without specifying any preferences. RDP's central reservation system is normally used in conjunction with our Customer Relationship Management (CRM) module, which is designed to track all relationships with guests to improve guest service and marketing. All guest visits are tracked from one or more RDP systems. Points can be awarded for each reservation. The number of points can be different for different seasons, room types, total dollars spent, and other variables. Guests can pay for reservations by redeeming points. Restrictions can be applied to control when "point reservations" are allowed. A complete history is kept of all point reservations from all resorts. The diagram below shows how the CRM works with Central Reservations. See Overview of Customer Relationship Management and Frequent Guest Rewards for more detail. Location of RDP Databases - Onsite or Central Location? Only one data server and IRM server are required to handle multiple properties. For sites with many properties additional data servers can be added for load balancing. The properties would connect into the central location using Microsoft Terminal Services or Citrix. Access is not available if the Internet connection goes down. The Central reservation computers access the remote databases via RDP's Internet Reservation Module Server installed at each property. Citrix or Terminal Services is not required. NOTE: This technology is currently under development - contact RDP sales for an estimated release date. When the data is all stored at the central reservation location, one IRM bridge server can be used to access multiple RDP systems. Guests, travel agents, groups, wholesalers, and condominium owners can all simultaneously access the same or different RDP systems using the Internet. However, at this time the functionality is not yet available. Please contact RDP Sales for more information. See Internet Reservation Module for more information. RDP's central reservation design allows you to mix and match RDP system types. For example, a central reservation office could manage 10 resorts. Five could be hotels, three timeshare resorts, and the remaining two wholly-owned condominium resorts. In addition, one resort could have a mixture of hotel rooms, timeshare rooms, and whole ownership. Reservations can be made simultaneously from each property and central reservations, with instantaneous update of the data. For example, if there is only one room left for a given day, that room can be booked from a workstation at central reservations, a workstation at the property, or by a guest, travel agent, or wholesaler using the IRM. All reservations are stored immediately in the RDP database. E-mail Integration for Guests, Owners, etc. Integration to POS, Phones, Credit Cards, etc.